You may be asking, “How do I choose the best thermal carafe coffee maker?” We’re here to help with that! We’ve done all of our research and reviewed a wide variety of products to make sure that you’ve got the best coffee makers to choose from. Before we get started showing you the products, here are some things that you should consider while you’re shopping. Afterward, check out our list of amazing coffee makers. Cup Capacity: How many cups will the coffee maker produce? Most of the time, you can make any amount smaller than this too; this is just a general rule for how much it can make in a single brew. 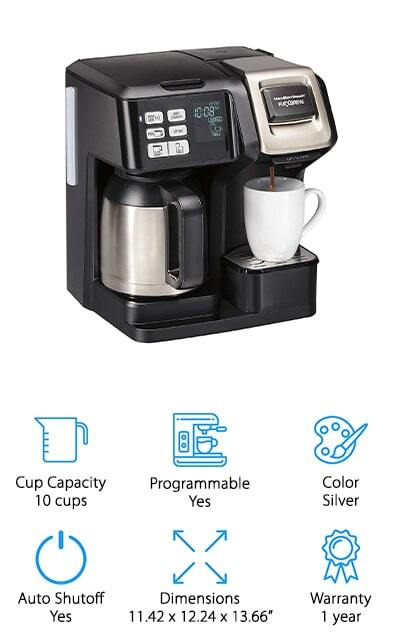 Programmable: Programmable coffee makers often have wake-up timers, automatic shut-offs, and even different brewing strength settings. They are great for people with busy lifestyles! We’ll let you know what to expect from the coffee maker here. Color: What color is the coffee maker? If it’s important that all of your kitchen décor matches, this is going to be important to you. We’ll let you know the main color or color combination of the coffee maker. Auto Shutoff: Automatic Shutoff is a feature that times how long the coffee pot has been on after the coffee has been brewed. Coffee makers with this feature will often shut off after a certain amount of time has passed. Dimensions: How big is the coffee maker? This can be important in smaller kitchens, or if you’re looking to improve counter space in your kitchen. You can determine how much space you’ll have left with the dimensions of the maker. Warranty: A warranty is a guarantee that the company stands behind their products. It means that if it fails before this time is up, the company will issue a replacement product or a refund if that’s what you prefer. Now we can get to the thermal carafe coffee maker reviews. If you like your coffee to be hot long after you make it, these are the coffee makers that you should consider. Our top pick and budget pick are the highlights of our selection, so make sure that you check them out first before percolating over the other options on the list. Get your favorite creamer ready, because we’re going to make some amazing coffee. The Breville Precision Coffee Maker tops off our 12-cup thermal carafe coffee maker reviews. This coffee maker has so many features, including a Steep & Release valve to allow the water to mingle with the coffee for longer. This becomes activated when the carafe isn’t placed on the hot plate, allowing you to pause and get a cup while the coffee is brewing. When you put the coffee maker in Gold Cup mode, it adjusts water temperature and brewing time to meet coffee-quality standards set by the SCA. This coffee maker will get the best out of your coffee, no matter what type of coffee that you use. You can switch between the flat bottom and cone filter baskets that are included, allowing you even more control over how your coffee is brewed. This truly is an amazing machine, with six presets and the ability to customize every detail of the brewing process. We absolutely love it. When you’re looking for a thermal carafe coffee maker on a budget, you can’t get more advanced than the Cuisinart Thermal Coffee Maker. You can control the strength of the brew, and the technology inside the coffee pot allows you to make hotter coffee without destroying how it tastes. That’s excellent expertise! It’s fully automatic and can be programmed to make coffee up to 24 hours in advance. 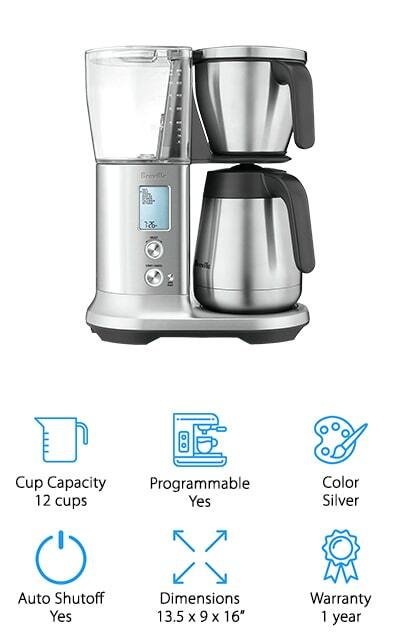 You can make all 12 cups at once, or set it to make between 1 and 4, giving it the variety of two different coffee makers in one. The thermal carafe keeps coffee hotter for longer and includes a stainless steel handle for decoration and insulation. The water tank has an easy-view window that allows you to see how full the water is without guessing, and you can pause the brew to get a cup right away! This is a pretty amazing system with some great features at an affordable price. Zojirushi makes the first 10-cup thermal carafe coffee maker on our list. While this is a slightly smaller machine, it still comes with an amazing host of features to sooth your coffee craving. The brewing temperature control heats water to the perfect temperature to brew the best coffee, regardless of what type of coffee you’re using. It also has a design feature that allows you to brew iced coffee. Adjusting the water-to-coffee ratio allows your iced coffee to not taste watered down by the ice later on. It has a brewing serve function that stops the drip when the carafe is removed. Plus, the carafe can keep your coffee hot for a long time after the brewing is completed. The permanent stainless mesh filter also includes a measuring spoon so you get the perfect amount of grounds for your coffee. It doesn’t get much better than this intuitive and fully programmable machine. You can mute it, too! BUNN is another well-known company when it comes to coffee makers and other kitchen appliances. The BT Velocity coffee maker comes with a double-walled and vacuum insulated carafe that keeps coffee warm for up to two hours after it brews. This eliminates the need to keep the hot plate on and risk the coffee burning. No one wants that! The spray head on the internal mechanism allows for complete flavor extraction from your coffee. The internal water tank is made of stainless steel and keeps water at a temperature that is optimal for getting the most out of your coffee. It’s also quick, with the ability to make ten cups of coffee in about three minutes due to the reservoir-style hardware. It even has an internal thermostat to make sure that you’re getting water at the perfect temperature. Because of the carafe, there is no warming plate in this coffee maker, so it will never burn! OXO makes this high-tech coffee maker with a thermal carafe for extended coffee warmth. Water is heated inside the machine and kept at the perfect temperature so that your coffee always has the perfect temperature. Plus, the rainmaker head on the drip mechanism makes sure that the entire coffee ground surface is soaked through for the perfect flavor extraction. The LED interface helps you program the entire machine, and you can use the brew cycle options to make anywhere from 2 to a full 9 cups of coffee at a time. The single dial controls this, making it simple to set up your coffee making methods. 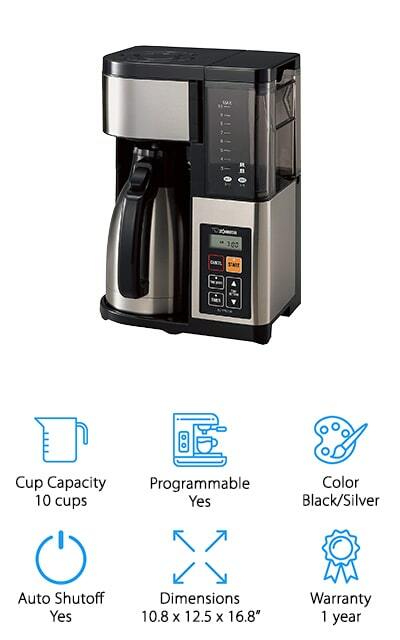 We love the different technologies that have gone into making this coffee maker, from the microprocessor that controls brewing cycle options to the internal thermostat that keeps water at the perfect temperature for great-tasting coffee. You can customize just about everything about how your coffee is made, and that’s a great thing. Cuisinart is back on our list with another affordable coffee maker. This one is a little more advanced and comes with a charcoal water filter, as well as a gold-tone coffee filter so that you get only the freshest coffee, made from the purest water you can get. 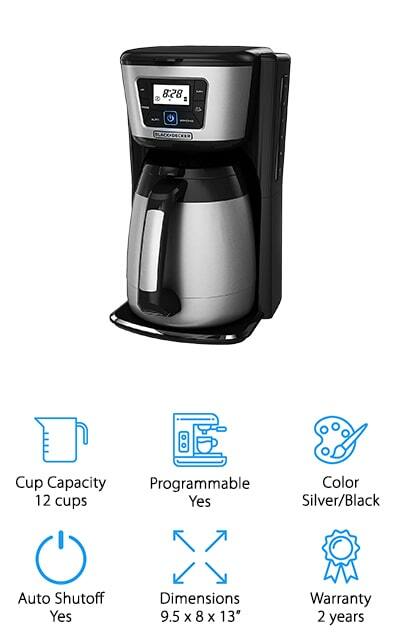 You can pause to serve yourself a cup right in the middle of brewing if you’d like, and you can even set it to brew anywhere between 1 cup and 4. It includes a self-cleaning function so that it will completely clean and descale itself without your input at all. This coffee maker is still fairly simple, but it’s built with a ton of quality-of-life features that take it to the next level. For an affordable and more ambitious thermal carafe coffee maker, it can’t hurt to give this one a try. You can make 10 cups at a time maximum, and the carafe is double-walled and insulated to retain temperature! Hamilton Beach brings customizability to a new level with their FixBrew Coffee Maker. You can brew a full pot of coffee with your favorite grounds, or a personal serving with a K-Cup pod on the single-serve side. You get two coffee makers in one with this machine! On the stainless steel thermal carafe coffee maker side, your coffee will stay warm for a lot longer. You can program the timer, auto pause when you brew, and it will automatically shut off when it’s finished. You can use a pod or a single-serving of grounds in the other side of the coffee maker. Each separate brewer has its own water reservoir for convenience. When you have multiple coffee drinkers in your home (or just like to change it up every now and again), try the FlexBrew. It will definitely please a wider variety of coffee drinkers than a solitary machine would. You’ll love it no matter how you brew! 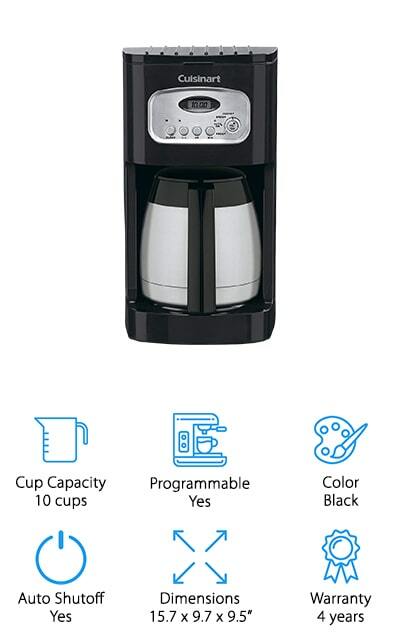 Black+Decker makes it onto our list with their thermal coffee maker. 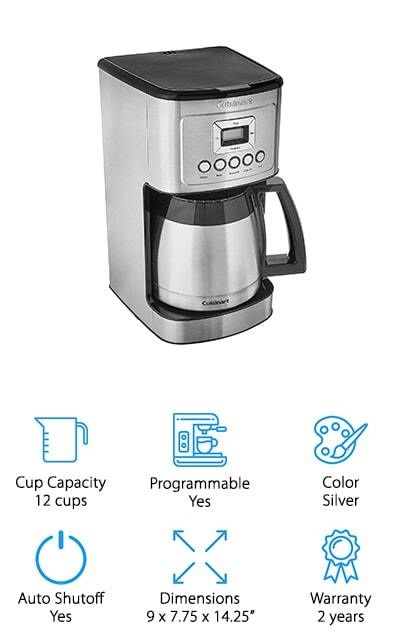 This is a full 12-cup coffee pot with a double-walled and vacuum-sealed carafe to make sure that your coffee stays warm throughout your morning. You can choose the strength of the brew and you have the option to make a smaller batch of coffee, between 1 and 4 cups if that’s what you prefer. The nozzle allows water to soak through all of the grounds to give you the fullest flavor without as much waste. The perfect pour spout mixed with the wide carafe opening will make sure you aren’t going to spill your coffee everywhere while you’re trying to serve it fast. 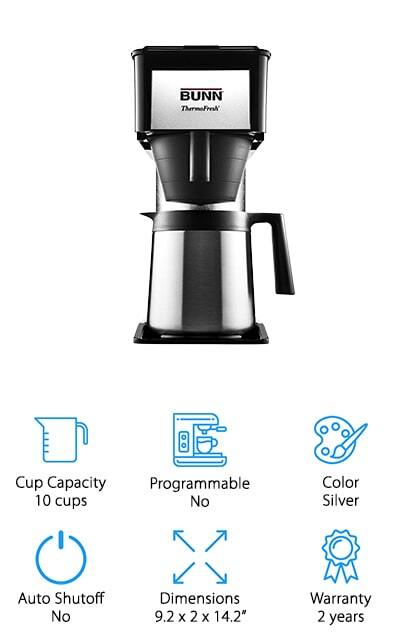 Everything about this machine improves your quality of life while also giving you these options at a more affordable price than some of the other coffee makers on the market right now. If you often drink your coffee long after it’s been brewed, you can’t go wrong! Bonavita makes this luxury coffee maker for the coffee enthusiast in your life. When you want something that provides quality results and more finely-tuned features, this is the one that you should go for. 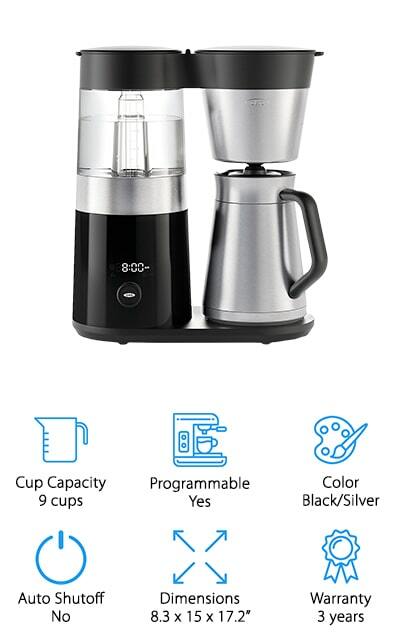 You can make 8 cups of coffee in six minutes or so with this coffee maker, and with the thermal carafe, you’ll have warm coffee for longer. During the brewing process, you can select the pre-infusion mode which mimics the pour-over brewing method of artisan coffee makers, allowing the coffee more time to ‘bloom’ and enhance the flavor you get from it. You get even saturation of your coffee grounds from the showerhead nozzle, and the flat-bottomed filter basket furthers the goal of even extraction during brewing. You can brew with a single touch, allowing for simple operation. 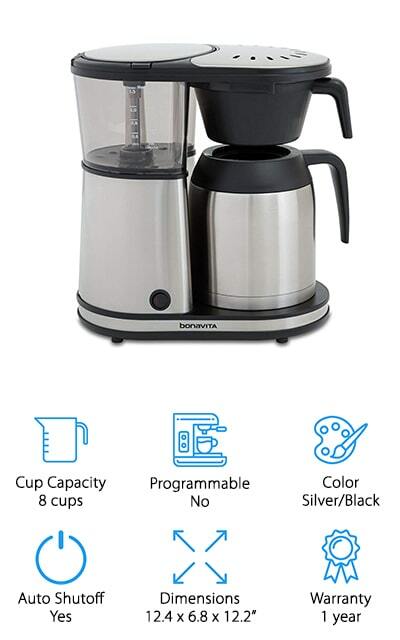 This brewer by Bonavita is certified by the Specialty Coffee Association for home brewing, and that’s how you know that it is a serious coffee maker! 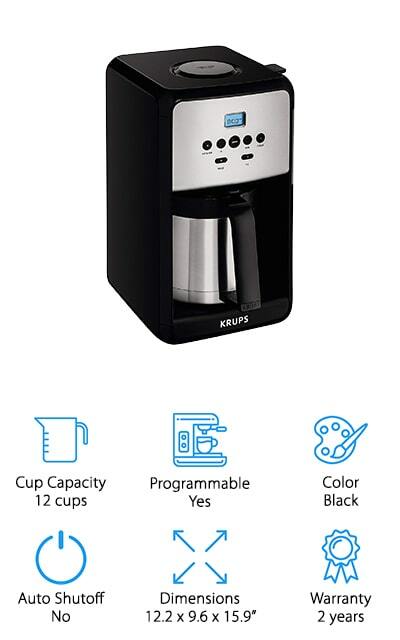 KRUPS makes this 12-cup coffee maker with a thermal carafe that will keep your coffee nice and warm for up to four hours after you’ve brewed it. It has a programmable digital clock so that you can set up auto start for first thing in the morning. You can brew at whatever strength you prefer, and you can even set it to make between 1 and 4 cups as well for a smaller serving size. You set the strength and other options with a combination of the LCD screen and a single rotating knob, so it’s easy to use as well. If you just can’t wait, you can use the pause and serve feature that will halt brewing until it’s replaced. It even comes with a cleaning function for descaling, so that you can select when you’re cleaning and it will adjust accordingly. This coffee maker is the perfect gift or addition to the kitchen of your favorite coffee enthusiast.